Touch top operation. 100 lumens, 3 AA batteries (not included). Operates on a touch-activated, three-stage dimmer for varying levels of brightness. 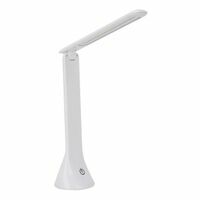 Portable lamp operates on a touch-activated, three-stage dimmer for varying levels of brightness and energy use. 23 bright LEDs. Low-23 lumens, Med-55 lumens, High-100 lumens. Battery saver feature (4 hour auto-off). Uses 3 AA batteries (not included). 0.85 lb. 9.5"L x 4.25"D x 4.25"W.